University of Houston Law Center alumnus Peter Taaffe '97. July 2, 2018 -- As the only attorney currently serving on the University of Houston System Board of Regents, Peter Taaffe's legal experience gives him a unique perspective when analyzing statutes and various governing documents. 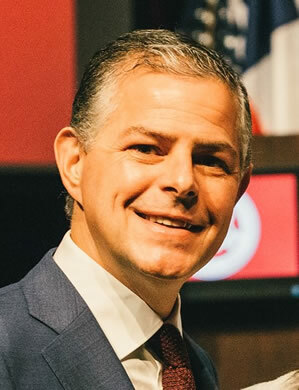 Taaffe, a 1997 alumnus of the University of Houston Law Center, was appointed to the University of Houston Board of Regents in 2013 by then-Gov. Rick Perry, where he currently serves as vice chairman. His term will end on Aug. 31, 2019. "I feel my legal training has helped with the work performed by Board of Regents," Taaffe said. "The role of the board is to provide strategic advice. As a litigator, you are trained to identify the scope of problems or opportunities, and then determine resources to get to the solution. That's a lot of what we do on the board." Taaffe noted UH's plans for a medical school, building upgrades at other system campuses the continued growth of UH-Downtown and the need for a new Law Center facility. "The board's focus for the Law Center will be on a new building, including funding for it," Taaffe said. "Whether it be private donations, or assistance from the university or assistance from the state. We hope a new facility can continue to serve the business and legal communities, as well as the general public." Taaffe is Of Counsel at the Buzbee Law Firm. He said his time as an attorney is split between business-related disputes and personal injury cases, which are both gratifying for him. "A similar concept applies to both kinds of cases," Taaffe said. "The business stuff I deal with is usually the underdog kind of person. It's very personal and emotional for them. For a personal injury client, a lot of times it's their livelihood that's been impacted. "We represent a lot of workers who are the sole provider for their family. They work with their bodies and are no longer able to do that. Their families could suffer, so it's also very personal. When your client is able to recover and you know that they are going to be taken care of, that's incredibly rewarding. Taaffe is on the advisory board for the Law Center's Center for U.S. and Mexican Law and previously served as an adjunct professor. He was one of several speakers during the Law Center's 2018 commencement ceremony in May at NRG Arena. "It was a great honor to be able to speak at my alma mater's commencement," Taaffe said. "I just tried to speak from the heart. People talk about the rule of law and lawyers at the guardians of that concept. I told them to always hold that as an anchor in what they do and to be proud of being a lawyer." Another key piece of advice Taaffe gave the class of 2018 was to maintain relationships not just with their law school, but with their former classmates as well. "I feel like as you get further along you start to discern pretty well if there's a problem that you're not the best-equipped person for it," Taaffe said. "Our class is lucky to have a lot of really good lawyers. As we've gotten older, people have developed different types of skillsets. "Some are really good on appeals, some are really good at employment, some are good at family law. It's a two-way street. You're helping a friend, but more importantly you're helping a client get to a good, competent lawyer. I will routinely send employment work or appeals work to friends."